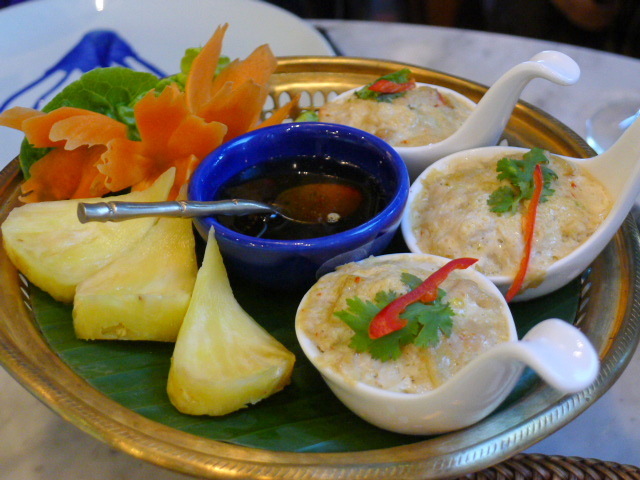 Blue Elephant is one of London’s most iconic Thai restaurants. It opened its doors over 25 years ago on Fulham Broadway but moved to Imperial Wharf in January 2012. The new space is luxurious and beautifully glamorous and was refurbished based on ‘Saran Rom’ Palace in Bangkok, previously the seat of Thailand’s Minister of Foreign Affairs. Décor aside, another strong selling point is that the restaurant is positioned on The Thames, offering those who sit outside on a nice sunny day wonderful views of the river. As an extension to the Blue Elephant restaurant, the Imperial Wharf location also runs a newly created Thai cookery school. 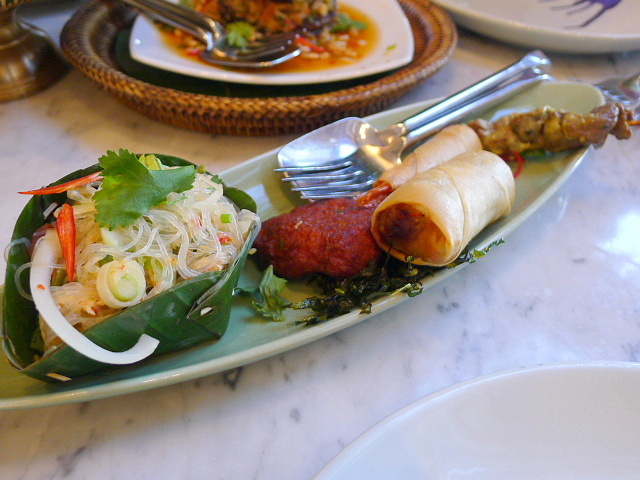 The menu is vast and diverse and is divided into three key sections: Thai cuisine of the Past, Thai Cuisine of Today, and Thai cuisine of Tomorrow. There are also a number of tasting menus including a vegetarian option. Chef Nooror’s Ma Auan, steamed minced chicken with crab (£14) yielded a good crab and chicken flavour. It had been flavoured with foie gras although this was difficult to detect in the dish. Accompanying the dish was a very tasty sweet and spicy sauce. The ‘Pearls of Blue Elephant’ (£15) starter selection included a Thai fish cake, spring roll, buffalo satay stick, paper prawns and enoki seafood salad. The ground fish cake was nicely spiced and went well with a sweet and sour sauce with cucumber and crushed peanuts. The spring roll was crispy, but more chicken in the spring roll filling would have worked better. The buffalo stick was unfortunately a little chewy, although the seafood salad of vermicelli enoki mushrooms, black fungus, mixed seafood and minced chicken tossed in a lime and chilli dressing was delicious. 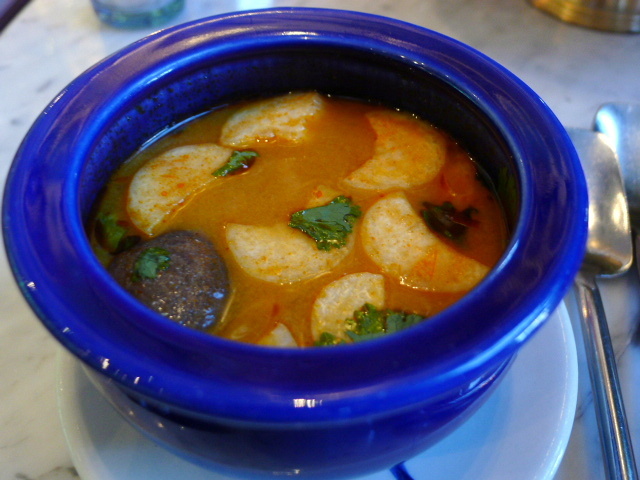 Tom yam koong was wonderfully spicy and sweet and sour, all at the same time. This was a fantastic soup with a good balance of flavours. But there was only one prawn in the soup, which at £9, was a little stingy. 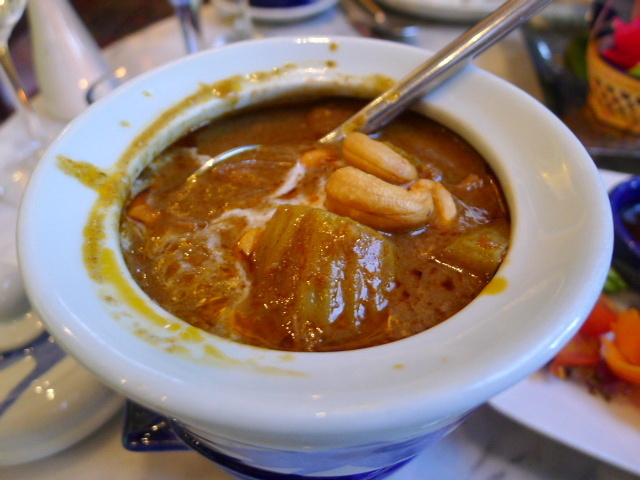 Massaman lamb (£21), a lamb curry of dried spices in coconut milk with Thai sweet potatoes, peanuts and cashew nuts, was yummy with a lusciously rich sauce. The spicing was well judged, and the creaminess of the sauce made it perfect for eating with lots of rice. The lamb was tender in what was a nicely cooked dish. 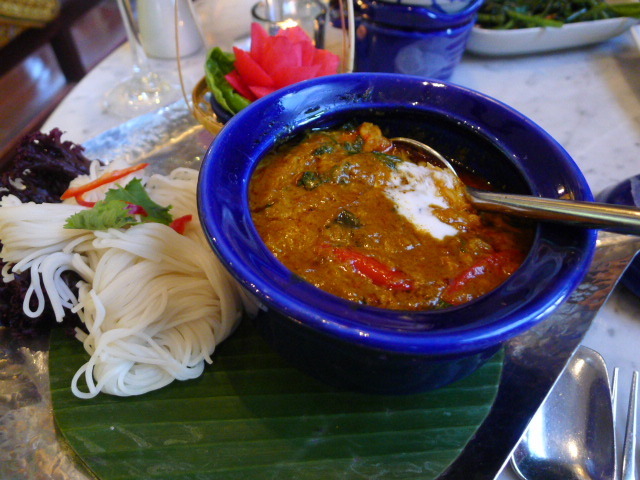 A crab curry (£28) with betel leaves – a Phuket speciality – also boasted of a scrumptious and creamy sauce. Accompanying the curry were some whole wheat noodles, again perfect for mopping up the sauce. The shredded crabmeat in the curry was lovely and sweet, and the spinach was nicely done. However there were also some crab claws that were bland due to overcooking which detracted from the dish. 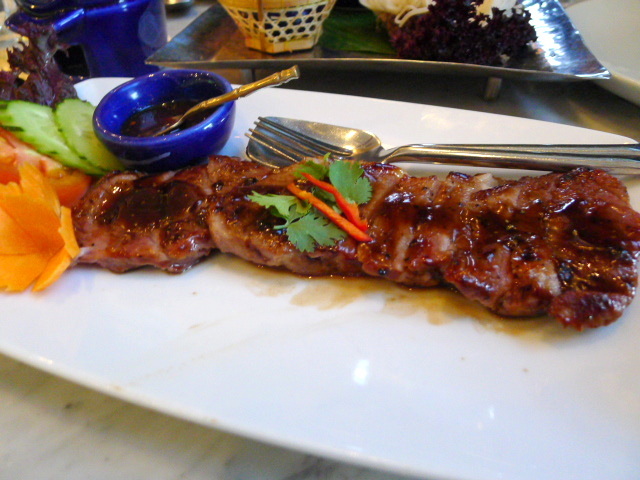 Nua nam tok, grilled marinated beef sirloin was tasty, although at £26 it could have been tenderer. It had been grilled with herbs and spices for added flavour, and a dipping spicy sauce matched the flavour of the beef nicely. 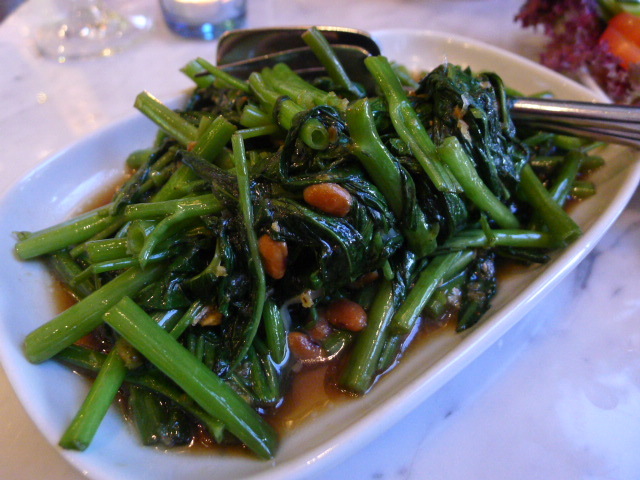 Stir-fried morning glory (£8) with garlic and soya sauce was delicious. The vegetables were cooked just right and maintained a touch of crunchiness, and the use of soya sauce was not too overpowering. 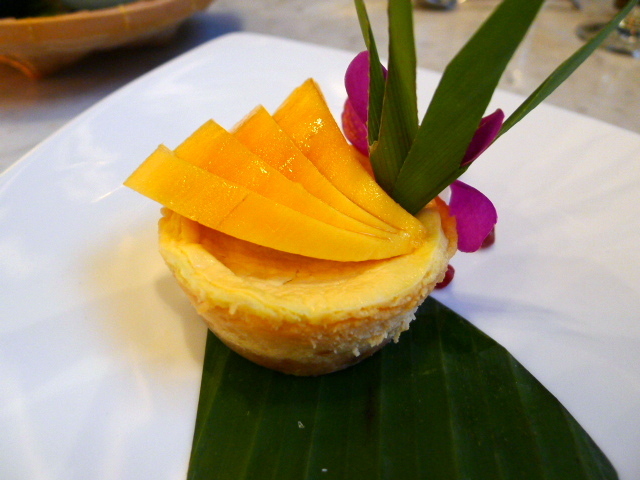 A homemade mango and longan cheesecake (£8.50) was creamy and velvety smooth, with its flavour being boosted by slices of sweet, ripe mango. 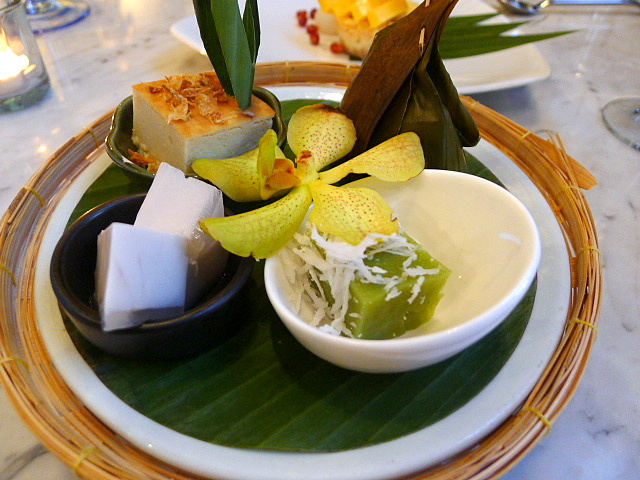 Kanom Thai (£8.50), a selection of four of the chef’s Thai desserts of the day included the jasmine cake, a baked moong bean cake; sodsai, triangular leaf parcels of steamed rice pudding with a caramelised crunchy coconut filling; and a coconut jelly. All were nicely done. Our meal proved to be a decent experience with charming service in a beautiful dining room. The food was also reasonably tasty with the showpiece being the sauces, both the ones that accompanied the starters and the ones served in the mains. These tasted like what good Thai sauces should taste like. The spicing and flavour combinations were just right. That said, not everything was quite spot on and some tweaking was needed with some of the dishes as there were a few elements that let them down such as the slightly chewy beef and bland crab. It may have been a decent experience overall, but the prices were rather pricey for the standard on show. Prices:About £31 to £58 for three courses and rice, excludes drinks and service.